Around 100 people marched on Streatham Jobcentre today in a fantastic start to the fight against forced psychological treatments for unemployed, sick and disabled claimants. 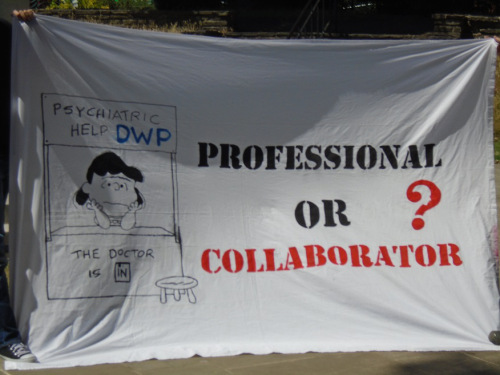 Protesters gathered in Streatham Memorial Gardens with many carrying banners showing the growing anger at the collaboration of mental health workers and charities with the DWP’s workfare and benefit sanctions regime. At just after 2pm the protest took to the streets, taking over the busy road before fnally arriving outside the Jobcentre which now also contains much of Lambeth’s mental health services.